In 2016 we set out our plans for observing the gravitational-wave sky with LIGO and Virgo. Things have gone pretty well! It has been a busy start to observing with our new detectors. We have announced our first gravitational-wave detections, won a Nobel Prize, and had our first gravitational-wave signal from a binary neutron star system. This discovery was accompanied by a counterpart signal which could be observed by telescopes across the entire electromagnetic spectrum, from gamma-rays through optical light to radio. Given our recent success, many people (hopefully including you) are interested in what we aim to do in the future, so we have to make sure that our plans are up-to-date. Gravitational-wave detectors are incredibly sensitive machines. It takes lots of tuning and careful engineering to get them to their full sensitivity, so that they can measure the tiny stretching and squashing of a passing gravitational wave. We have never done these things before, so there are lots of challenges to overcome. Our plan is to alternate between working on improving our detectors and conducting a series of observing runs. These are periods when we use the detectors to try to find gravitational-wave signals, giving us a chance to operate the detectors, analyse our data, and explore what is out there. As the detectors improve between observing runs, it should become easier to make new detections. Figure 1: A plausible timeline for observing with the LIGO, Virgo and KAGRA detectors over the coming years. The colored bars correspond to observing runs, with the colors matching those in the sensitivity plots below. Dates become more uncertain the further they are in the future. Between observing runs, we work on tuning our detectors to improve their sensitivity and have engineering runs, where we test the instruments and check that we understand how they behave while running. The numbers above the bars correspond to binary neutron star ranges, the average distance we could detect a binary neutron starsystem out to, as measured in megaparsecs. For the completed runs, we give the achieved binary neutron star range; for the future runs, we give the expected range (see the curves below). Compared to our previous plan, observing runs have been pushed back a little, mostly because we spent longer observing (there was lots to discover). Our first observing run (O1) spanned September 2015 to January 2016 and included the two LIGO detectors (LIGO-Hanford and LIGO-Livingston). This is when we made our first discoveries. Our second observing run (O2) started in November 2016 and finished in August 2017. Virgo joined for the last month. Our next observing run (O3) is currently planned to begin in the latter half of 2018. It will last for 12 months and will again feature both LIGO detectors and Virgo. Looking forward, our observing plan includes the Japanese detector KAGRA for the first time. 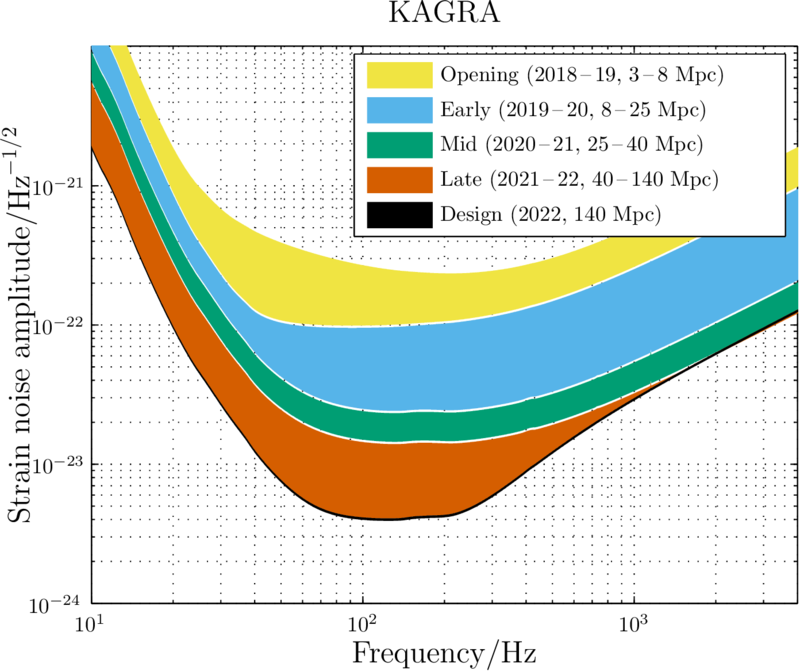 KAGRA should be joining us for observations in a couple of years’ time, with the first observations in 2020. The two LIGO detectors, Virgo, and KAGRA should all reach their best (currently planned) sensitivities by 2022. A further detector, LIGO-India, will also be added to the family after this. There’s lots to look forward to! Including more detectors in our network of gravitational-wave observatories makes it easier to detect signals and helps us locate their origins—Virgo made a big impact on our localization of sources at the end of O2. 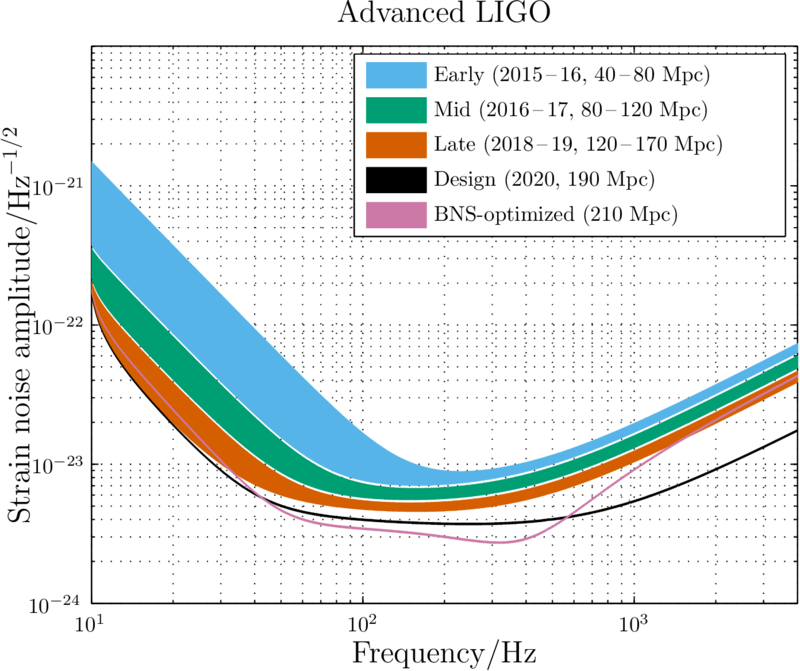 Figures 2–4: Our current plan for how the sensitivity of the Advanced LIGO, Advanced Virgo, and KAGRA detectors will progress with time. The curves show the expected sensitivity across a range of frequencies. The lower the sensitivity curve on the plots, the better we are at measuring gravitational waves (the easier it is to detect quieter signals, like those from sources further away). We cannot predict exactly how things will go, so we have a range for each observing phase. During our first two observing runs (O1 and O2), we about matched our prediction (see the timeline above). The BNS-optimized curve is an idea to specially tune the detectors to search for binary neutron stars. The key gives the expected dates when we will reach each sensitivity, as in Figure 1 above, as well as the binary neutron star range associated with each sensitivity. 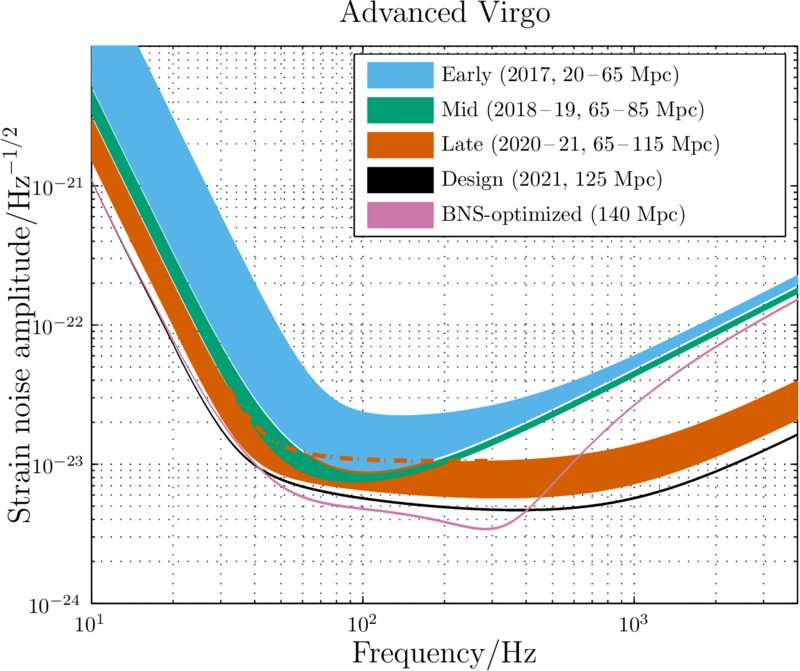 The LIGO and Virgo curves are the same as in our previous plan, though some of the binary neutron star ranges have changed a little because we are using an improved method to calculate these. We are including KAGRA in our plans for the first time. Astronomers are aiming to search for more multimessenger counterparts to our future gravitational-wave detections. Therefore, the expected number of detections and how well our network of gravitational-wave detectors will be able to determine the location of their sources are important pieces of information. Discovering light or neutrinos from a gravitational-wave source gives us a much richer understanding of its properties and can help us test Einstein’s theory of general relativity or measure how rapidly the Universe is expanding. So far, only one gravitational-wave source, our first binary neutron star system, has had a counterpart. There will be many more to come. During O3, we expect around 1–50 binary neutron star mergers to be detected. The uncertainty on the number of detections comes from both our uncertainty on how often binary neutron stars merge (we’ve only found one so far) and because we are not exactly sure of how sensitive our detectors will be. By the time we have all five detectors (LIGO-Hanford, LIGO-Livingston, Virgo, KAGRA, and LIGO-India) fully operational, we expect to detect around 11–180 binary neutron star mergers per year. There will be lots for astronomers to do! Over the last couple of years, we have made some big steps in gravitational-wave and multimessenger astronomy. However, the story is only just beginning. We will continue to work on improving our detectors over the next few years. Each improvement will help us make new detections and push the boundaries of what we know. As we better understand our instruments and the gravitational-wave sky, we may need to revise our observing plans. The future looks bright.